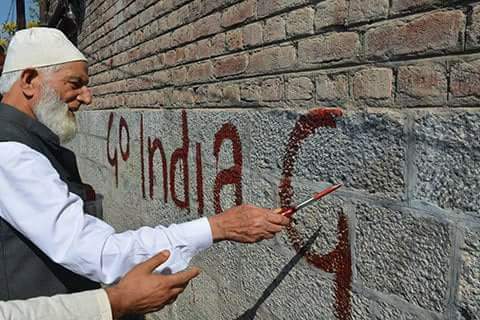 A man writes “Go India” in Kashmir (Wikimedia Commons). Kashmir, a disputed portion of the mountainous northern state of Jammu and Kashmir in India, has been a site of contentious animosity held consistently since the independence of both countries in 1947. The organizers of the partition of British India intended to allow the majority Muslim communities of Kashmir to freely decide which country they would declare their allegiance to, but Maharaja Hari Singh, the last provincial monarch of the region, pledged his support to Indian rule in exchange for military protection. Kashmir holds the only predominantly Muslim community among the Indian states, making the state an outnumbered religious and cultural group within the largely Hindu country. Although India has stated that they do guarantee the rights of Muslim communities in their secular society, the government comes into conflict with Pakistan, which desires Kashmir for symbolic reasoning. The country believes the region is a symbol of Pakistani identity originating after the 1947 partition upheaved the lives of many Muslims who had migrated to this region believing it would fall under Pakistani control. Disputes between Pakistan and India have led to two prior wars in 1947 and 1965. This statement appears to have been finally put to the test on February 14, in a devastating suicide bombing attack in Kashmir that left 46 paramilitary-police officers dead. The Pakistan-based terrorist organization Jaish-e-Mohammed, a group dedicated to the spread of fundamentalist, Sunni Islamic beliefs, claimed responsibility for the terrorist attack. Adil Ahmed, the suspected bomber, is thought to have joined the group sometime in 2018. Following this attack, India made claims of holding Pakistan directly accountable for aiding and abetting Jaish-e-Mohammed in an attempt to further destabilize the Indian government within Kashmir. New Delhi appealed to the United Nations Security Council (UNSC) to list Jaish-e-Mohammed’s leader, Masood Azhar, as a global terrorist. Yet attempts have been thwarted in the past due to China’s strong relationship with Pakistan. The thriving strategic relationship held between Beijing and Islamabad has prompted China to act as Pakistan’s protector in the UNSC. In doing so, China is in fact indirectly aiding the continued survival of this terrorist cell. In an effort to take matters into their own hands rather than relying on an international agreement and possible non-action, Indian planes crossed the Line of Control on February 26 in an attempt to strike a possible location of Jaish-e-Mohammed’s base of operations within the Pakistani border. Pakistan denied any loss of life as a result of the airstrike but did promise retaliation due to the infringement of its sovereignty. Pakistan also denied any involvement with the initial incident, with the Prime Minister Imran Khan stated, "We have fought a war, lost 70,000 people in a war on terror, now we are moving towards peace, why would we do this?" On the other hand, in its direct actions and confrontations with Pakistan, India seem too willing to escalate tensions towards war and more loss of life. It is noteworthy that Indian elections are scheduled to be held in April and May, fueling suspicions that Prime Minister Modi and the BJP may have a lot to gain by fueling tensions and feeding into popular opinion and anger. These two sides, both holding weapons of mass destruction, need to put pride and anger aside in an attempt to come together and discuss what needs to change in Kashmir to protect life and attempt to create a better mechanism that promotes regional stability. The Kashmiris should make the decision for themselves on how to identify moving forward as either Pakistani or Indian, but in order to reach peaceful self-determination, extremist groups must be removed from the region to the best of both countries abilities. Pakistan needs to take more of a leading role in eradicating violent extremists from propagating within its territory.